No smuggler could be arrested in the drive on Kachchhapia Dhala area under Hoaikyong union around 8pm on Friday following a tip-off, Teknaf Police Station OC Pradip Kumar Das said. The detained Rohingyas include 50 men, 39 women and 26 children, according to the OC. Police were communicating with the officials to send the refugees back to the camps, Pradip said. 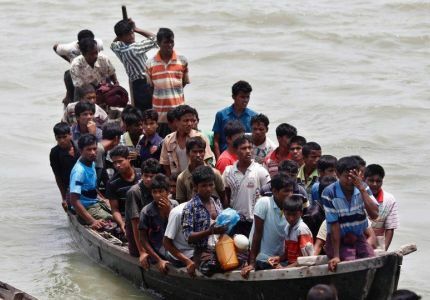 “A syndicate gathered these Rohingyas to smuggle them to Malaysia by sea. They are residents of different refugee camps in Teknaf and Ukhia,” he said. Perilous sea journeys of the Rohingyas, over 1 million of whom have fled to Bangladesh from persecution and deadly army operations in Myanmar, often make headlines now. Some 35 people, believed to be Rohingya Muslims abandoned at sea, were found on a Malaysian beach last month in one of such incidents. Bangladesh had also rescued many refugees from the smugglers in similar drives earlier.